You wanna know why NBA MLB and NHL players stand for the anthem? It’s in their collective bargaining agreement. It’s not in the NFL’s. So if this was such a big deal why didn’t the NFL put it in the agreement like all the other leagues had? And what’s more unpatriotic an NFL football player kneeling for the anthem or your president refusing to go to the WWI tribute because it was raining? 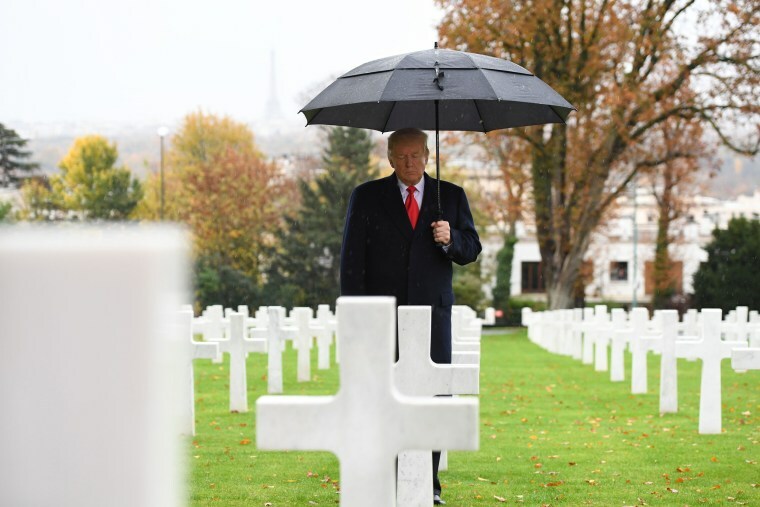 your president refusing to go to the WWI tribute because it was raining? The Marines have already said THEY decided to ground the helicopter. So unless you are prepared to call them liars, the decision had nothing to do with Trump. And Trump both attended and spoke at an Armistice Day tribute at Suresne Cemetery. If this were a democrat man. You can bet they would say the Marines are lying. what's more orange,.. the leaves?.. the Presidential Seal?.. or Mr President? I mentioned the other day that he was looking quite orange. However, the fact is, he DID honor Armistice Day. Nobody but moronic media and never-Trumpers truly believe he doesn't respect the military. Frogleg, Chipeace and COTiger like this. Lasalle whether you like it or not he is your president too. Just like the two scumbag senators from California represent me. When he dodged the draft? Draft-dodging does not equate to disrespecting the military.